The Disk Sander is used to smooth materials such as woods and plastics. It is also used to remove small amounts of waste material. It is a dangerous machine if safety is ignored. Goggles must be worn at all times. Hands and fingers must be kept as far away from the rotating disk as possible. A guard, making it impossible to use the wrong portion of the rotating disk must be in permanent position. If the right hand side of the disk were to be used the material would be quickly lifted upwards. This would be very dangerous. A Dust extraction unit should be connected to this type of machine. This is very important as it will extract dust particles produced when the machine is in use. The disk rotates in an anti-clockwise direction which means only the left portion of the disk should be used. The rotation of the disk holds the work down on the table. Lose clothing must be held back by an apron. Long hair must be tied back for personal safety. The diagram below shows the machine operator carefully using the disk sander. The material is carefully and lightly pushed against the rotating disk and at the same time moved from left to right. Only the exposed part of the disk can be used because of the position of the guard. 1. 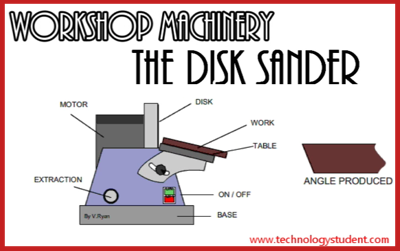 Draw a diagram representing the disk sander. Label the important parts. 2. List safety factors that apply to this machine. Most disk sanders have an adjustable table. This allows the material to be sanded to an angle. Releasing a locking nut allows the table to be adjusted, the locking nut is then tightened keeping the table in position. This can be very useful. However, the gap between the table and the disk increases as the angle is increased. This means that greater care must be taken when sanding material to produce an angle. If the sanding disk is permanently bolted to a table an emergency stop button must be added. This means that the disk sander can be turned off by simply tapping the foot switch. 1. Draw a simple version of the disk Sander and identify all its dangers. 2. For each danger, explain how safety procedures should be applied to ensure safe operation.